Mr. Gregory had a motorcycle. It was a piece of work. The tires were bald. The front tire was underinflated. The rear tire was overinflated. Mr. Gregory loaned the motorcycle to his son Jimmey. But to be safe, Mr. Gregory gave his son a couple of modified helmets. Jimmey was taking Phillip Senteney on a ride on the bike. Jimmey crashed. Phillip was hurt. 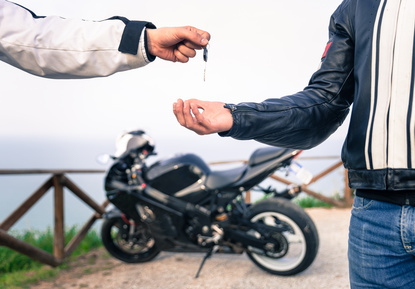 Mr. Gregory had motorcycle insurance with $100,000 in liability coverage. Phillip Senteney’s dad was not satisfied. He refused settlement for $100,000 alleging that the homeowner’s policy should pay as well. Mr. Senteney filed a declaratory relief action naming Mr. Gregory. Eventually, Fire Insurance Exchange became party to the action and defended against the allegations that the Gregory homeowner’s policy was implicated. When the trial court refused to grant Mr. Senteney the relief he sought, he appealed. The Nevada Supreme Court’s opinion is Senteney v. Fire Ins. Exchange, 101 Nev. 654, 707 P.2d 1149 (1985). The court explained that the Gregory homeowner’s policy excluded coverage for claims arising from the ownership, maintenance, operation or use of motor vehicle. The Nevada Supreme Court agreed with the trial court stating that the policy’s exclusion language was unambiguous. The Court decided that the theory of negligent entrustment fell within that exclusion. The theory of negligent maintenance of the tires was also excluded. Finally, the modification of the helmets also arose out of the ownership, maintenance and operation of the motorcycle.